The rate at which robots are being used in the modern world for day to day activities is so high, that opening your door to find a robot standing outside ready to deliver some goods you ordered would not be very shocking. 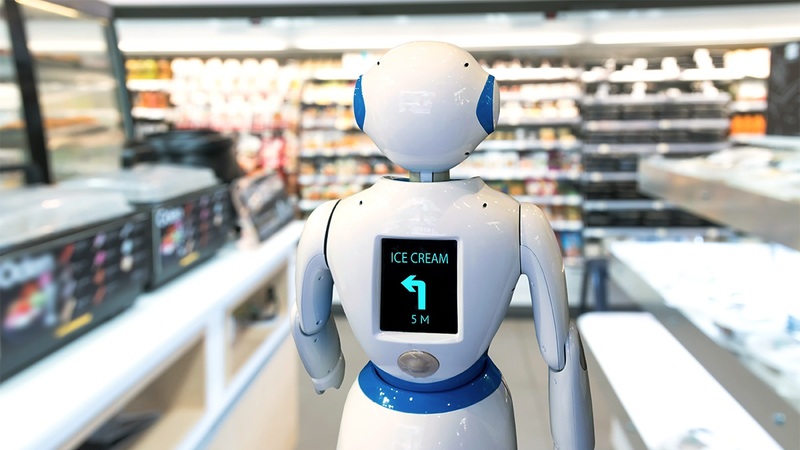 Robots are now being incorporated into the world of retail, where autonomous robots are given the tasks that human store attendants would normally do, for instance guiding shoppers on where to find the stuff that they are looking for. Autonomous robots fit perfectly in the store and warehouse setting, as they are designed to work just like humans, since they come from a field of artificial intelligence. The autonomy in these robots allow them to work over an extended period of time where they can easily go without human intervention. This makes them well suited to work in an environment where they are required to have interaction with humans, and it makes humans more comfortable with being around them as well. While having robots working in stores and supermarkets is a whole new idea, it is one that is not hard to get used to in the long run. Robots might even bring forth competition because chances are that customers may be eager to go for shopping at a place where they are more likely to be attended to by a robot. And this is not necessarily a bad thing, if it helps a store perform better in terms of sales because this way, everyone goes home happy. Both customers and retailers. It is no lie that some people would much rather deal with robots instead of humans. The robots are created in such a way that the humans will have the option of either talking directly to the robot, or using a screen on the robot’s body to directly input exactly what they need. There is no possibility whatsoever that the robot might be in a bad mood, or have a bad attitude or any of those things that are natural for a human being to have once in a while. Some of these things are exactly what those people who would rather deal with robots are looking to avoid. Robots can also work hours on end without having to go on a bathroom break or a lunchbreak, neither will they get tired at some point and need to take a nap, or get an emergency that would require them to go home. This means that they will always be available to provide the required services to the customers. This provides for good and efficient customer service. Robots however do not need to be limited to just the stores, since some like the industrial robot arm can be useful in warehouses as well. Intelligent robots can be generally good at managing things as they can retain a lot of memory, and this could help in arrangement of things and this also means that they will know where everything is and it would be easy to find something. Humans can easily forget so this would help everything to run more smoothly. Robots can also keep records as well as work on inventories. When a robot is in charge of stuff like finances, one can be sure to get an accurate invoice, as the robot will always have all the right records at hand. Apart from keeping track of records and inventories and providing customer care, another major thing that an autonomous robot can be good for is providing good entertainment to customers. They can dance, play some music or even sing, interact with customers and get their feedback among other things. This kind of thing would encourage customers to feel welcome and keep coming. The store should however not be the last place that robots could work, because they could also come in handy with performing deliveries to customers at home. This may be a faster and more efficient way to perform deliveries, since the robot cannot confuse an address and neither can it get lost.